​International rock superstars Paramore are making their highly anticipated return to Australia for their first headline shows in four years, bringing Tour Four to Melbourne’s Rod Laver Arena, Sydney’s Qudos Bank Arena and Brisbane’s Riverstage this February. Paramore are touring in support of their ARIA #3 charting album After Laughter with special guests to be announced. Paramore’s fifth album was recorded at Nashville’s historic RCA Studio A - also their first time recording in their beloved hometown. Produced by Justin Meldal-Johnsen (M83, Jimmy Eat World, Beck) and Paramore’s own Taylor York, After Laughter signalled the return of founding member Zac Farro to the band. It debuted at #3 on the ARIA Charts, featuring the hugely successful singles Hard Times - which has had over 50 million views on its colourfully playful video which Billboard declared “addictive” - and Told You So which saw over seven million views in its first two weeks alone. Long regarded as an exhilarating live act with a non-stop show led by the fearless Hayley Williams, with Taylor York on guitar and Zac Farro back on drums, Paramore are a bona fide juggernaut, selling over six million albums and leaving a trail of sold out headline arena tours in their wake. They have sold out iconic venues around the world including Madison Square Garden and Wembley Arena, and performed show-stealing headline festival sets at the likes of Reading and Leeds Festivals, Riot Fest and their own four-day festival cruise PARAHOY!. 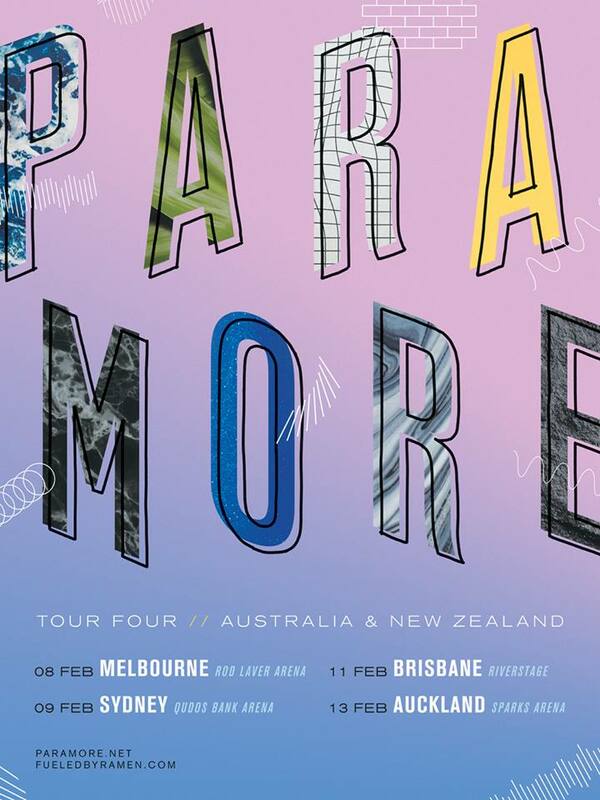 With Tour Four hitting some of Australia’s most well-loved arenas, these will be Paramore’s first headline shows Down Under since their last tour in February 2014. Paramore have had a truly remarkable run since forming in Nashville in 2004, from their gold-certified debut All We Know Is Falling (2005), to 2007’s 2x platinum breakthrough Riot! and platinum-certified albums Brand New Eyes (2009) and Paramore (2013). The Grammy-award winning band have consistently drawn both critical acclaim as well as a wide-ranging list of international honours and accolades, multiple Grammy nominations and a win for Best Rock Song (for Ain’t It Fun), two People’s Choice Awards, three NME Awards, three MTV Video Music Award nominations and much, much more.